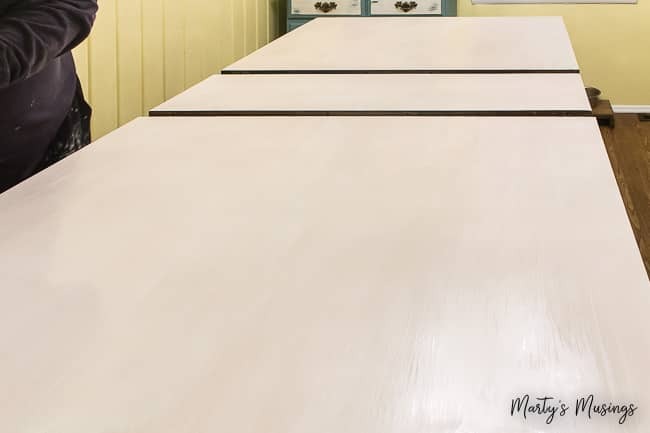 Want to know how to paint a kitchen table the right way? 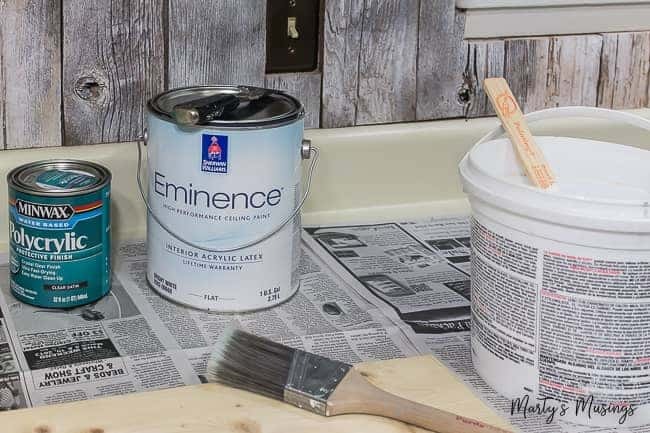 Just follow these easy steps and you’ll have a farmhouse DIY project that lasts for years to come! 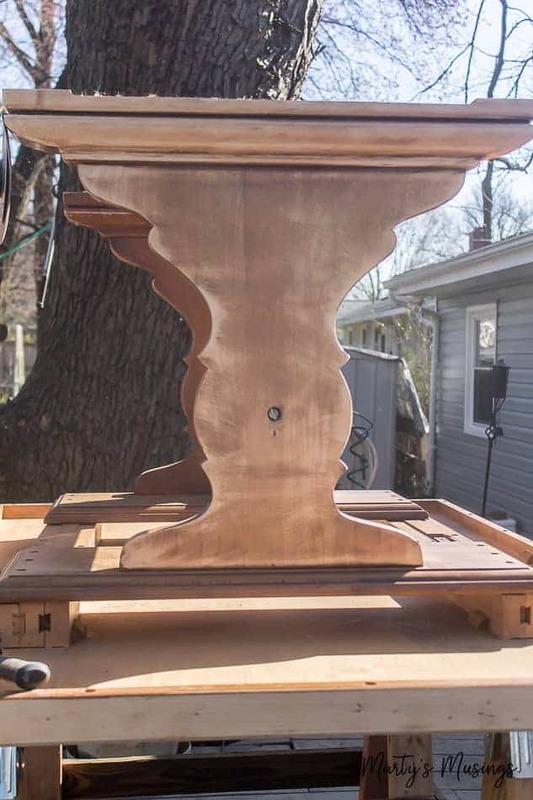 How do you know when it’s time to makeover a piece of furniture or time to pitch it out onto the curb for garbage pickup? Our kitchen table had seen better days. I bought it for $150 (including six chairs) at a yard sale many, many years ago. Watermarks, scratches, pencil art. This table had been well loved. Tired and worn, having seen five children through homeschooling, games, dinners, puzzles and conversations, we debated what to do with it. Try to sell it and get a few dollars or give it a makeover? As usual, I enlisted my DIY hubby and his expertise, and after hours of debating tables and chairs he finally decided to give it a go with the table that has grown old along with us. 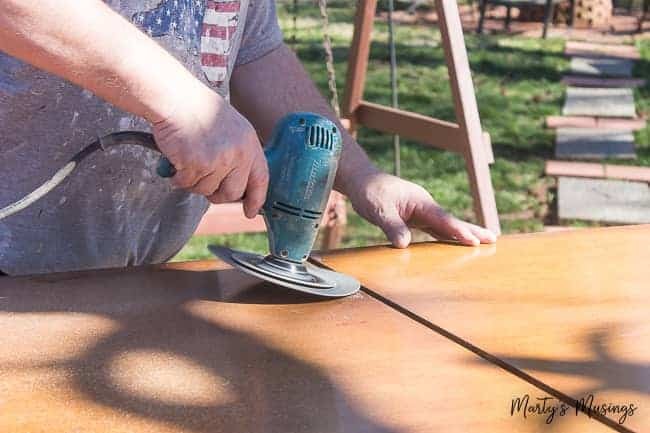 Since we still believed there was life left in our farmhouse looking kitchen table now was time to give this solid wood table a fresh new look. 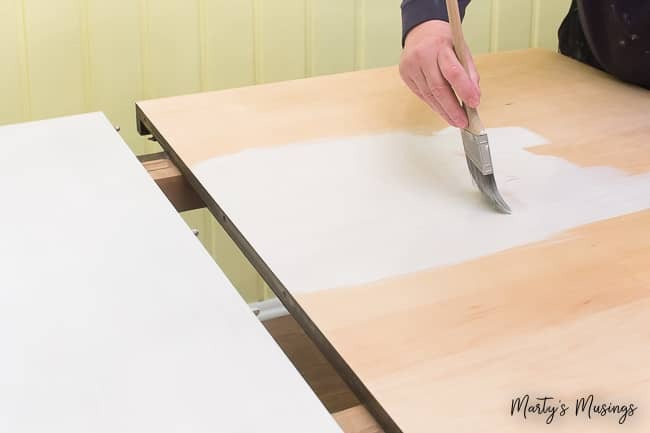 Here’s my husband with all the details on how to paint a kitchen table! Pretty self explanatory! 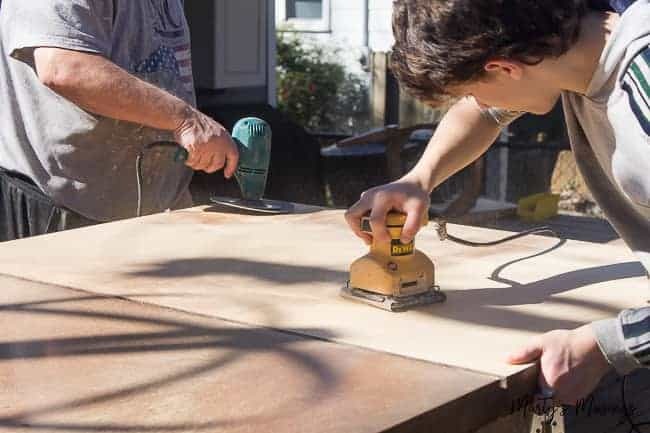 Luckily for us the weather was perfect since we needed outside space to sand the table down to bare wood. 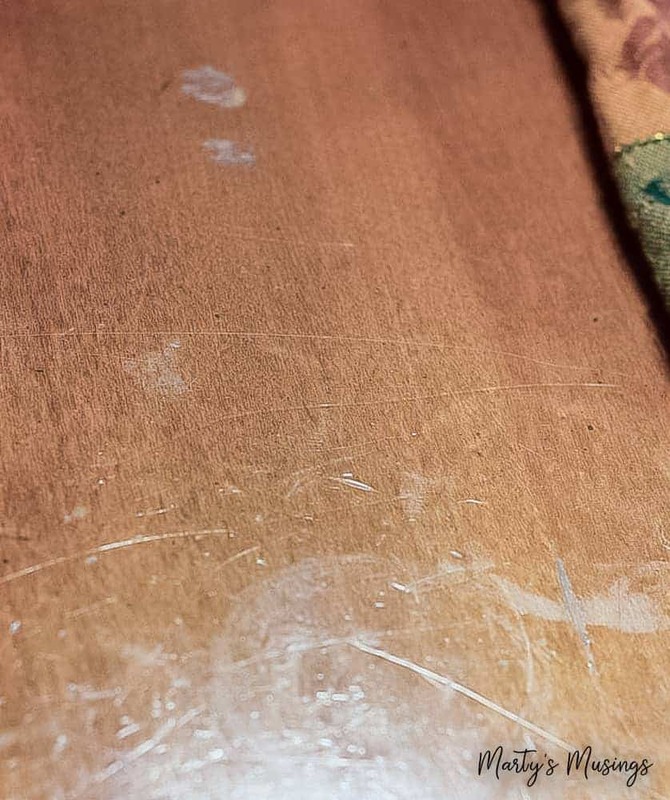 The first step was to use a grinder to remove as much of the finish as possible without damaging the wood. This tool has a 60-grit pad on it; that’s basically gravel glued to a circular disk! It makes quick work of anything, but you do have to be careful not to go too deep. Because the grinder did leave swirly circles in the wood, we went back over the entire surface with a palm sander and 80-grit paper. This was just enough to even out the surface, revealing a really beautiful pine surface…exactly what I didn’t want. Here’s the team working together; me on the grinder and our youngest son on the sander. Perhaps the biggest danger in a project like this is hitting the wall and getting sick of sanding. But once you make that first pass, you’re committed. This big flat surface wasn’t too bad, but the story changed when we moved down to the base. With no other choice, we flipped the base on top of the over-turned top to use as a workspace and started over. This was MUCH more tedious and difficult since we had curves, crevices, and sharp stops. There were, indeed, areas that had to be hand sanded and remained darker than the bare pine. However, this actually added some character in the end. You get an idea of the variance in the surfaces. 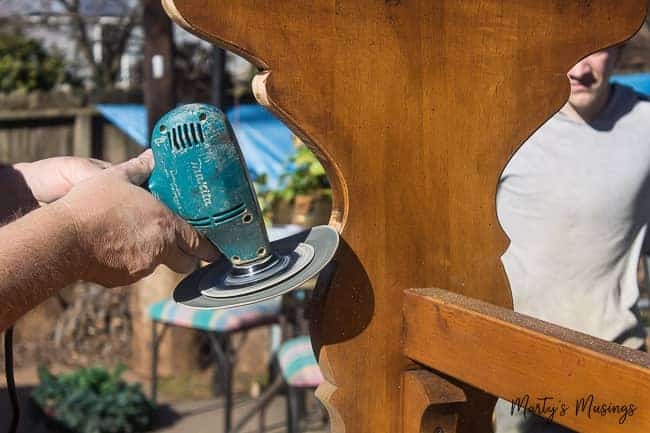 We also had to be mindful of the fact that we were working upside down; what we couldn’t see as we sanded would be easily seen when the table was flipped over. Progress, but still not finished. See the swirls from the grinder? The palm sander takes care of those. Before it was all over, the table was completely dismantled. I hadn’t intended to do that, but it was clear that the more access we had to each nook and cranny, the better the result. It was a good choice and allowed for a suitable result. And this is the stripped table, top to bottom! It was attractive…in an unfinished, unattractive pine sort of way. This would end the outside work, since I decided to re-finish inside. Too many birds, bugs, critters, pollen and dust. I made the decision to go white and then try and work backwards with some kind of “faux distressing.” Yes, that may be a new technique with unknown results, but forward I went. The direction I went may startle even the most weathered artisan; I chose to mix white latex ceiling paint with the Minwax water based Polycrylic in a clear satin finish. With 23 years experience as a painting contractor, I knew the go-ahead was the fact that these were both water based products. Normally, and under any other circumstances, mixing paint and poly would be a bad idea. But, you can go ahead as long as you mix water with water or oil with oil. Oil and water do not mix. There was no magic formula or ratio. I just mixed, starting with small portions and sampling on a spare pine piece of lumber. When the right effect and depth was achieved, I increased the ratios and went to the table. This is the first coat of the paint/poly combo right on top of the bare pine. The leaf, in the center of the table, was done first and ended up being my experimental area. If I totally blew whatever happened on the leaf, I could just pull it out and start over without re-working the entire table top. Working with the grain here in nice, long strokes and catching any drips at the edges. I wasn’t completely sold on the solid white effect, so I experimented on the leaf by lightly dragging a rag dipped in dark walnut stain across the surface. Bad move – didn’t like it at all. So I quickly removed as much as possible and re-coated with the paint/poly stuff. Here’s a critical tip; if you are custom mixing any kind of multiple products, be SURE and mix enough at the very beginning for the entire project, even if it means you finish with too much. If you run out before you finish, it is highly unlikely that your new mix attempt will match the first round you started with! Trust me, you don’t want to let this happen. So here is the top with two coats of the milky paint and polyurethane combination, not quite dry. I still wanted just a bit more depth, so a third coat of the same and then two top coats of just the polyurethane to finish. Five coats in all, lightly sanding and cleaning in between each. And here is the end result. The grain of the leaf actually runs opposite the rest of the top, so it looks slightly different in color in this picture. Not as jarring in reality. Back to Marty: My husband actually completed this project five years ago. Back then he was a tad bit concerned about the wear of a white top, but I figured with five coats of poly we should be good. Here’s the table with a shot from last Christmas. What do you think? We love the contrast of the wood base with the painted top. 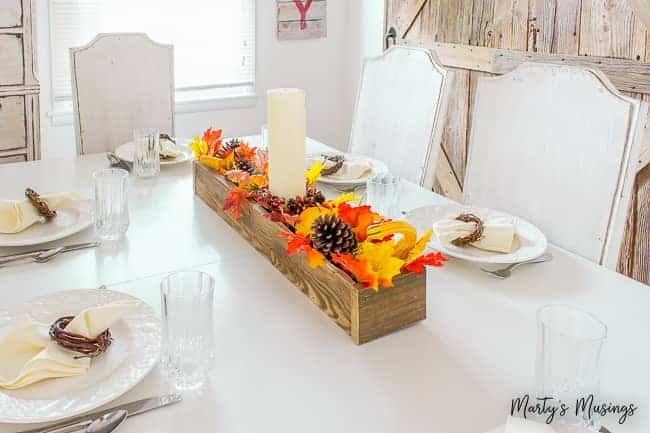 The room feels so much lighter with the big white table instead of the large dark slab. 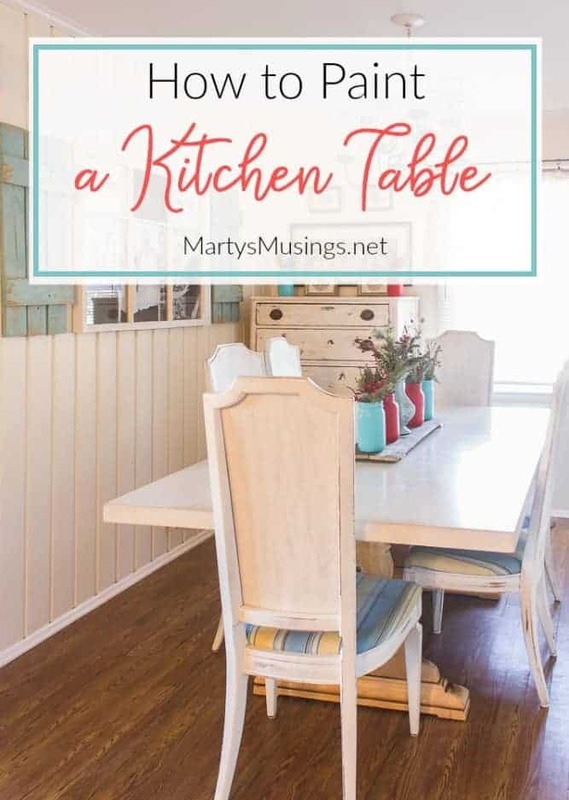 Who knew when we painted our kitchen table that a few years later we would take down our living room wall, totally gut our kitchen and start over? ♥ Small Ranch Home Kitchen Remodel: The Dream Begins! Kinda strange how your plans change at different times what you do with a piece of furniture or a wall, hmmmm? 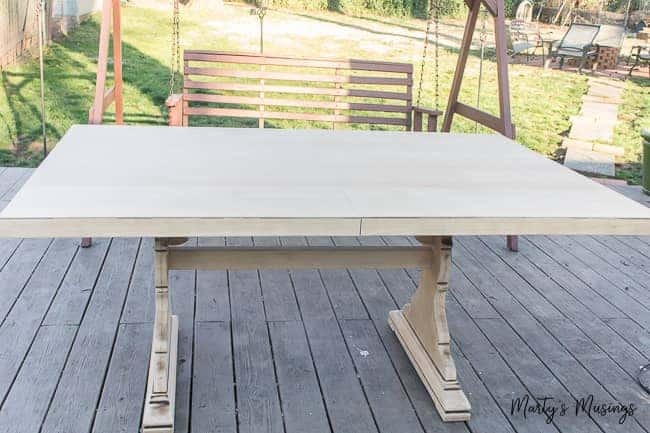 So far am really liking your white trestle table top with pine base. 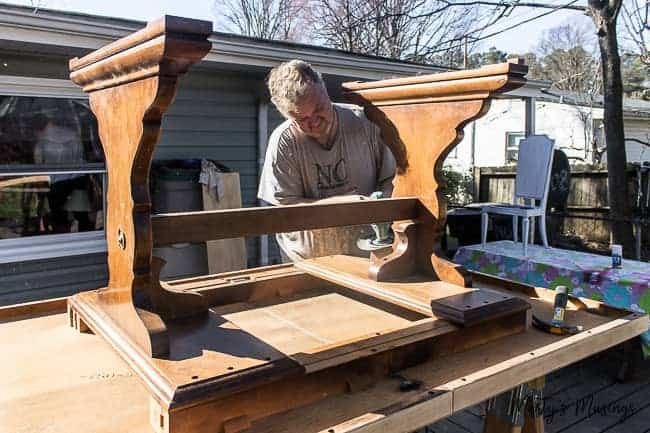 I have an antique trestle table out in shed, been meaning to refinish it for long time, has dark stain on it from when I bought it in KY few years ago.Where I would put it tho who knows. Other than it ,used as side table, usually, we don’t have dining table,chairs , or dining area in our single wide mfg.home . We sold our other table/chairs couple years after we bought this place. Had a nice buffet/hutch also but no room for it along with my hoosier. Later realized by taking out a bottom/top cabinet in kitchen would have had room for hoosier. By then way too late as had sold hoosier also right after we moved in here.. This place wasn’t what we had in mind to buy but at price of places here was all we could afford./still had our place in Ky paying for on our SS. Is very expensive to live here in many regards. Lots of well to do people and older people with money. G.J.Is most expensive city in CO for medical bills as well as car/house insurance and other amenities.. Internet service is horrible and way too expensive without good choices. No cable out here in rural areas at all.. If I had known how expensive it was wouldn’t have wanted to move here from KY. Still miss our great house and 1 1/2 acres of land. Enjoy your “newly redone” table,looks great,lots of work huh? Think mine will be also. 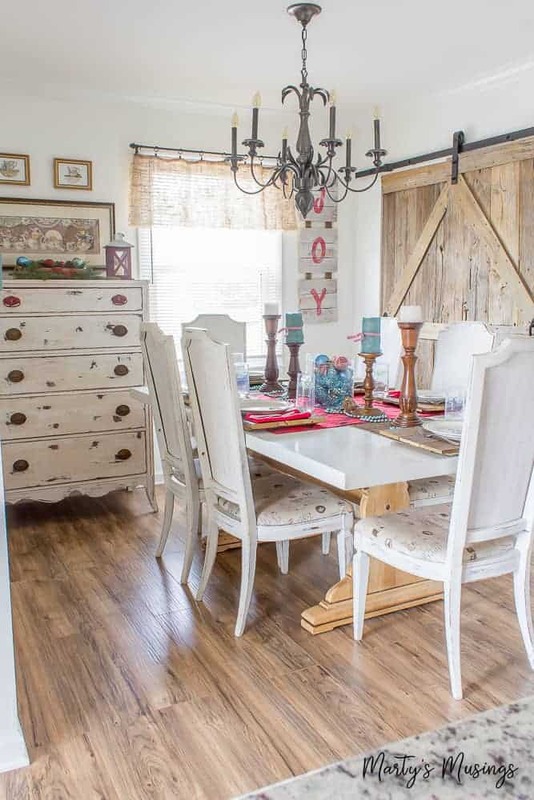 The white sure does lighten up your dining area. Hi, JaneEllen. I wish you good luck with your table! 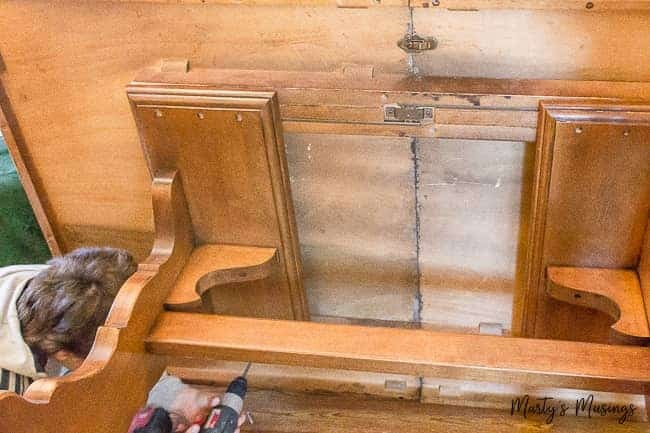 It was definitely a lot of work for my husband but it has held up well and was a better solution for us than spending a lot of money buying something new. Thanks for reading!